In the second instalment of the Maxi the Lifeguard series, there’s a giant problem to fix and a big mystery to solve. After a huge storm, Maxi and his mates, Rachel and Felix, discover that rubbish is being flushed into the ocean through a stormwater pipe. They are not happy about the garbage that's ending up at the beach, so they decide to hold a protest. It’s a great idea, but they must work super hard to get people to take notice and spread the word. And as they try to encourage people to turn up to the protest, they are equally as determined to find out who’s responsible for the rubbish being flushed into the ocean. In the first book in the series, In Deep Water, Josh the school bully makes it almost a hobby to get in Maxi’s way. In The Stormy Protest, things are no different, as Josh tries to steal the spotlight and make the protest all about himself. Then there’s the discovery about the trash in the pipe. The responsible person is the last person in the world Maxi wants it to be, and he’ll have to make some hard decisions about doing the right thing. Book two in this great new series is just as fun as the first. Maxi and his friends are great characters for kids to fall in love with — bold, independent and smart. And the story is action-packed and filled with adventure. Just like in book one, at the back of the book you'll find important information about how to stay safe at the beach and a fun activity to reinforce the message. I love Maxi's five beach safety tips. They provide great advice every kid at the beach needs to be aware of. 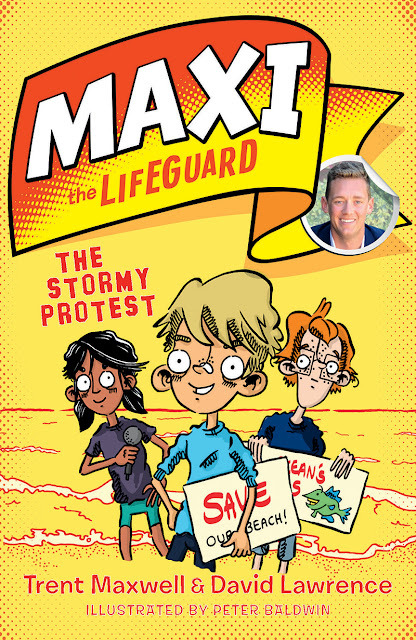 If you know junior readers who are looking for a new series to become obsessed with — kids who like adventure and the beach — the Maxi the Lifeguard series is a perfect choice.